At Doi Tung, you get to experience both the beautiful scenery of the hill and to learn about the life and social-development works of the late Princess Mother and her Doi Tung Development Project (since 1987). Located on Mae Fa Luang District, you can travel to Doi Tung through the Highway No. 110 for 48 kilometers and take a left on Highway No. 1149. 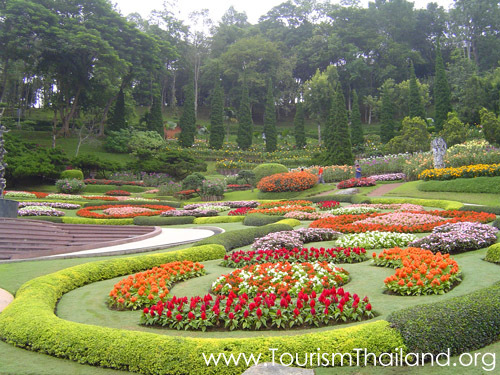 While on the road you’ll be enjoy driving through beautiful surroundings as well as interesting attractions like the Mae Fa Luang Garden, Akha, Muser tribal villages, Phra That Doi Tung where Buddha’s relics are enshrined, and, most importantly, Doi Tung Villa (Pra Tamnak Doi Tung), the former residence of the Princess Mother who passed away in 1995 after spending years working in many projects to help the underprivileged hilltribes. The villa has later become symbol an effort to stop the opium cultivation in the area. The nearby Suan Mae Pah Luang is also an interesting attraction featuring beautifully landscaped garden filled with numerous kinds of plants and flowers. Open daily from 7.00 a.m. to 17.30 p.m.